The FLOWLINE II bag filter housings offer the most cost-effective solution to single bag filter housing requirements. Its unique one-piece body design eliminates the traditional body to bottom cap circumferential weld and provides a secure, no by-pass internal seal for operational integrity. The FLOWLINE II is available with Eaton’s new Splash Guard safety accessory option. Hinged cover with swing bolt closure opens and closes quickly – and adjusts to different opening directions. Heavy-duty, yet lightweight one-piece body construction. 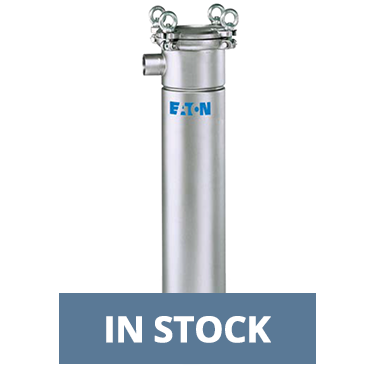 A FLOWLINE II stainless steel bag filter housing from Eaton is the best choice for industrial, commercial and OEM applications that do not require a Code Stamp. Its cost-effective design incorporates all of the features heavy duty applications demand, including a one-piece body design, an investment cast swing bolt cover that can be adapted to different opening directions in the field and a quality stainless steel restrainer basket for reduced pressure drop. FLOWLINE’s stainless steel construction ensures years of trouble-free, consistent performance at a competitive price.